Finisterra offers 1, 2 & 3 bedroom apartments. Please select a unit that you like, fill out your name, number, and email, and you will be redirected to our quick and convenient online application. Not seeing what you're looking for? Availability changes every day, if you tell us what your needs are we’ll call you when availability changes. All room dimensions are approximate and may vary by apartment. Finisterra proudly offers one, two, and three bedroom apartments for rent in Tempe, AZ. Spread out when you choose from one of our unique and versatile floor plans. As you browse our selection of floor plans, begin to imagine how your things may look inside, how you’ll layout your bedroom, and where you’ll hang that signed concert poster you got when you saw your favorite band last year. Discover your next home at Finisterra. Finisterra features a modern aesthetic with classic features and apartment amenities. As you explore our thoughtfully designed floor plans, we know you’ll appreciate the designer finishes that are included. Our spacious one, two, and three bedroom apartments include big, bright windows that allow plenty of natural sunlight in. Feline friends love bathing in the sun as it streams through your windows. At Finisterra, you can enjoy a modern, yet classic aesthetic in a picturesque setting in Tempe, AZ. Extend your living space outdoors with a private patio or balcony at Finisterra. Enjoy spending warm summer nights relaxing on the patio with your favorite cold beverage and the company of friends. 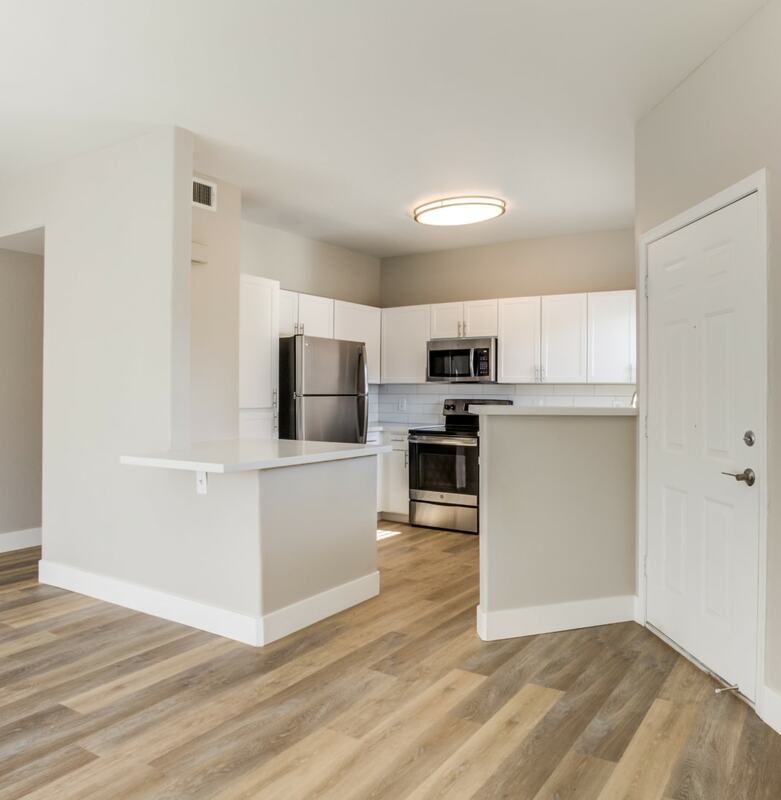 Contact us to learn more about the floor plans and current availability of our one, two, and three bedroom apartments for rent at Finisterra.